Joining us today is Susan Schreyer, the author of the just released Shooting To Kill, the fifth book in the Thea Campbell mystery series. 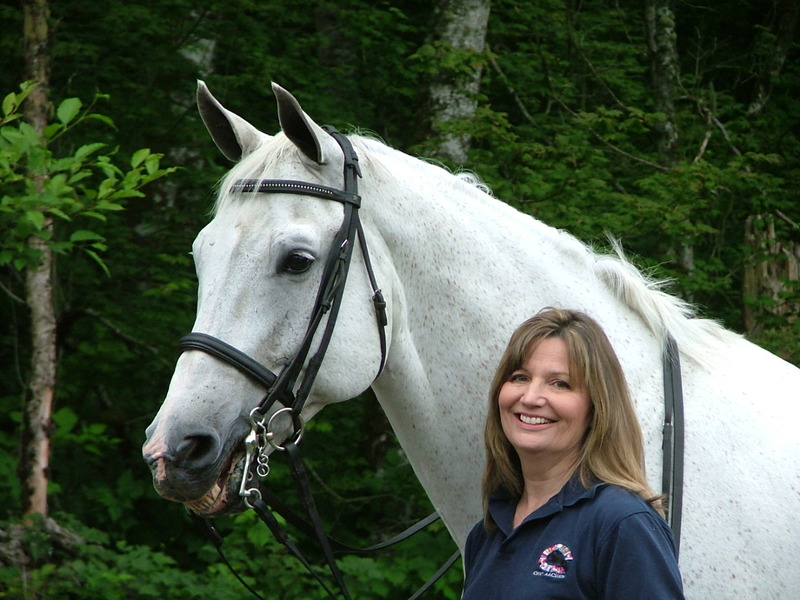 Set in the real-life town of Snohomish, Washington, her books feature amateur dressage rider and solver-of-crimes, Thea Campbell. For those of you not familiar with dressage, it is a type of very precise, formal riding that you see in the Olympics and in the Disney movie The Miracle of the White Stallions. When not working diligently on her next book, Susan trains horses in the art of dressage and teaches people how to ride them. Today she talks about one of the exultant moments every rider hopes to have. Take it away Susan! I was watching a video the other day—Edward Gal and Totilas (European and World Champions, with the highest scores ever achieved) in a freestyle ride that earned the pair a score in excess of 90%—and was struck by something rather profound which, of course, like any truth is not new, but re-experienced. That truth is: good riding, really good riding, transcends the correct application of the aids and the ability to perform the various movements. Do you agree? I’ll bet you do. Now, tell me this: what is the defining moment—the transcendent point in time where technically proficient grows a soul and becomes art? How do you recognize it when you see it, feel it? I believe it is that moment when you cease to be the controller of the other creature, and become one—a symbiotic relationship, if you will. You can see it in the relaxation, the fluidity of both parties. There exists a grace that, when I see it (even on video), can reduce me (and likely a couple other of you) to tears. It’s that powerful. You cannot mistake it, you cannot pretend it isn’t there. When witnessed, it hits you in the heart. When you experience that moment it is like nothing else, no matter how technically wonderful, that has come before. It is an ease that lies at the level of breathing, an effortless balance that requires only intention to shift direction or gait, an open door that allows access to levels of power at once heady and frightening when first encountered. It’s the Buzz Lightyear moment: to infinity and beyond. The Holy Grail of dressage. If you’ve been riding for a while, and trying to improve, there is a good chance you’ve experienced this—even if for a brief moment six months ago. Quite a number of riders are familiar with that transcendent point. Perhaps it was fleeting, something that happened by “mistake.” Or, if you’re very lucky (not to mention diligent) it was something you achieved and can return to at will. Nevertheless, it is that joining of our souls to that of our four-legged companions that keeps us going, keeps us striving, keeps us getting our butts out to the barn when we’d rather be curled up with a glass of wine and a good book. This possibility to become one, to join with our noble friend, gets us into the saddle when our bones are too old and our bodies hurt. We smile when we remember the times we touched the dream, and we willingly try again for just one more taste. 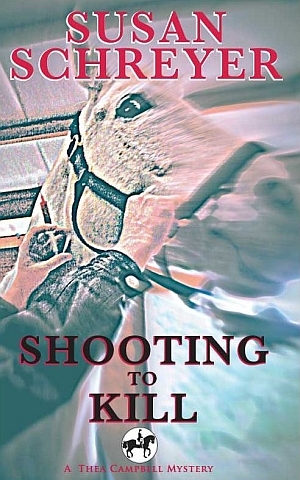 When Thea Campbell’s veterinarian collapses after accidentally injecting himself with a horse vaccine, Thea rushes to his aid. Despite her best efforts, the much-loved vet dies. In the wake of this tragic fluke, Thea reconsiders her own cautious approach to relationships. Life, Thea decides, might be shorter than you expect, and procrastination a death-bed regret. She immediately accepts her best friend’s last-minute wedding invitation and embraces the planning of her own marriage to fiancé Paul Hudson. However, on return from her friend’s wedding, Thea has little opportunity to pursue her new philosophy. Her veterinarian’s death has been ruled a murder, his young assistant arrested and accused of deliberately substituting euthanasia solution for the West Nile vaccine. The only person to believe in the assistant’s innocence is Thea’s sister Juliet. She intends to investigate and begs Thea for help. But Thea believes the case is closed and the police have arrest the right person. Besides, she intends to concentrate on planning her wedding. …However, the chilling fact is Thea was right about life being shorter than expected. Procrastination is not on the killer’s agenda. Sounds like a great mystery, Susan. Best wishes with your book! Thank you, Angela! It was fun writing, and I particularly enjoyed the opportunity to include more of the horse world in this one — it can be a dramatic setting, even in real life! What a fantastic video, Susan – beautifully orchestrated and so calmly gorgeous. Thanks for that. And thank you for telling us about that “oneness” experience. I am just now getting to that place with my Maximus where I feel him and know when he feels me. It is awesome. Glad you enjoyed it, Patricia. Totilas has been call the “horse of the century” and he truly is. You don’t have to have a horse at that level to understand that oneness, though, and as you pointed out, that feeling is awesome. It can put me on a cloud for the whole day when it happens. Best of luck with your riding! Thanks for stopping by Cher’ly! Always good to see you! Very beautiful, I agree! Didn’t you want to be sitting in the saddle for all of that? I could just imagine what that kind of power and responsiveness must have felt like. What a thrill! Susan, I’m so not a rider. LOL I’ve only been on a horse a few times, but I admire the beautiful creatures. Your description of that perfect breathing for two moment made me think as an actor of those times the actor and character become one. Or the dancer is so one with the music, that the performance is breathtaking. And what about those times writing when the story/characters seem to take over and your fingers flash across the computer keys as if guided by someone else? It’s like the moment the humming bird hovers before taking a sip. Priceless. Your book sounds really interesting, Susan. Good luck with sales. Thank you, Marsha! I know what you mean about that transcendent moment crossing into other things we do. It is a priceless gift to be able to slip into that other consciousness and become one with whatever you are doing — be it riding, acting or writing. You are obviously a writer — best of luck with all you do! Sounds like a great mystery, Susan. I’ve fallen a little behind on reading your series, but loved the first two so I’ll have to take time to order the rest of them. I went through your area a few weeks ago with my sister and her husband when I was on the west coast and thought of you. I’m delighted you’re enjoying the series. There’s lots coming up for you in the next three books. They’ve all been a lot of fun for me to write, and the characters aren’t done with me yet. The sixth one is underway and I can barely stand to go to my day job!